Last week, the Padres picked up former top Indians prospect Francisco Mejia in a trade. On Monday, they lost their own for the season. San Diego reported that shortstop Fernando Tatis Jr. sustained an avulsion fracture in his left thumb. He will have surgery Tuesday and miss the remainder of the season. The 19-year-old is expected to miss six to eight weeks, but the Padres hope he'll be ready for the Arizona Fall League or Winter Ball. "He was one of the youngest players in the league," San Diego GM A.J. Preller told MLB.com. "We challenged him, and I think he responded to the challenge. In baseball, you have to respond to failure. He's shown he can be given a challenge, then come through with flying colors. ... He was able to take his game to a different level. There were a lot of positives from this year that he can still take into the offseason." The No. 3 overall prospect left Thursday's game with the San Antonio Missions after injuring his left thumb sliding into second base in the sixth inning. 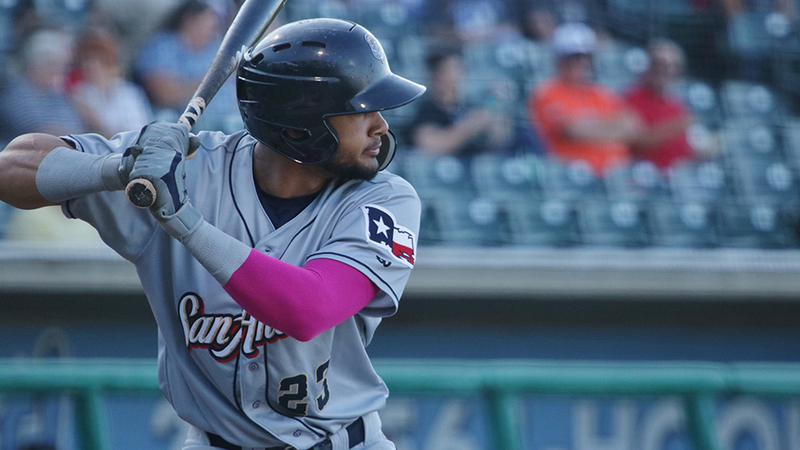 Tatis ended the campaign hitting .286/.355/.507 and leading the Texas League with 179 total bases and 77 runs scored. He ranked second with 42 extra-base hits, two behind teammate Austin Allen, the club's No. 28 prospect. Tatis batted .327 since the end of April as the second-youngest player in Double-A behind only top overall prospect Vladimir Guerrero Jr.
Tatis represented the Padres in the Futures Game on Sunday in Washington, D.C., where he had two singles in five at-bats. "Ultimately, guys that have this surgery come back and their range of motion is good, their strength is good," Preller told MLB.com "It's more of a hiccup than anything else."